The Russian word for openness, Glasnost was introduced as a public policy by Mikhail Gorbachev. While his long term aim may have been to improve the freedoms of the Russian people, his more immediate goal was to increase pressure on conservative apparatchiks to accept his “perestroika” economic reforms. While the US typically equated Glasnost with freedom of speech, in fact it was an attempt to bring transparency to the workings of the Politburo. 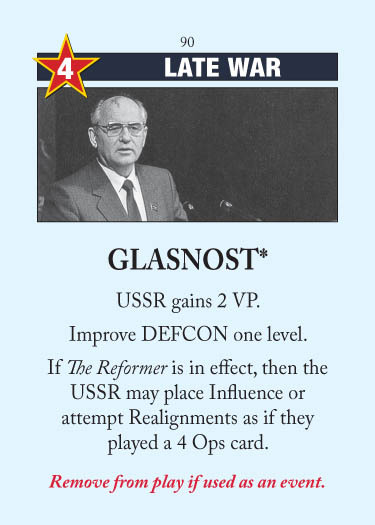 If The Reformer hasn’t been played, Glasnost is probably not getting played as an event unless you really want 2 VP for Wargames or autovictory. 4 Ops is a lot to give up, and raising DEFCON is usually inconvenient since you’re just giving the US a battleground coup. If you do want the 2 VP that badly, then headlining it is probably your best option under these circumstances. If The Reformer has been played, then Glasnost becomes a great headline. Playing it in an Action Round is still a little inconvenient, because you can’t use the event to coup DEFCON back down to 2 in the same Action Round. But the chance to play 4 Operations in the headline and get 2 VP is definitely worth starting AR1 at DEFCON 4. If The Reformer hasn’t been played, then this event turns into a quasi-ABM Treaty for the US, albeit one that costs 2 VP. Whether this is a worthwhile investment depends on the situation, of course, but if you can use it to flip a battleground it probably pays for itself. If The Reformer has been played, then you’ll almost certainly send this to space. It’s not a DEFCON suicide card, but using it as an ABM Treaty doesn’t work any more. You could conceivably use the 4 Ops of the card to repair the damage done by the USSR’s 4 Ops, but you’re still giving up 2 VP (not to mention raising DEFCON for the USSR’s next AR). This entry was posted in Late War, USSR Events and tagged glasnost. Bookmark the permalink. Great analisys. Speaking about Gorbachev… isn’t it a bit too much two cards and such powerful cards to represent the influence of the Leader who meant the end of the USSR??? I understand that it’s somehow necessary to have them to balance the presence of several US late-war devastating cards but it seems to me Gorvachev ends up being the most influential leader in the game above Kennedy, Kruchev or even Nixon, isn’t it? On the other hand Gorbachev was a major factor to the end of the cold war. And in a game about the cold war that is significant. …okay, if you meant that in a grim “playing a game of Civilization sense” where rights & standards of living don’t matter but sheer power and conquering crap does… the answer is still yes. They called it the “Era of Stagnation” before Gorby for a reason. The cancer in the USSR already existed, and at best Gorbachev helped Russia *start* treating it. Deals with the West also helped Russia trundle along. Alternative history is hard, especially with things like “tottering governments that are unstable but need an unknown push to fall,” but it’s entirely possible that if a generic hardliner had been Premier, the USSR’s economy could have collapsed earlier and everything gone to crap (read: Turn 9 Purge played by the US then SALT’d back on turn 10 or something). More generally, power doesn’t necessarily come from the barrel of the gun; giving power to the people is not a sign of weakness, but rather a source of strength. I suppose that’s what TS is trying to get at abstractly in the cards: Gorbachev charms the West with deals and peacemaking (the DEFCON improvement) and a newer, friendlier USSR makes allies around the globe. In the alternative universe where the USSR was already doing fine and winning the Cold War (The Reformer’s VP check), Gorbachev represents the responsible steward as the USSR softens up a bit to be the fit unipolar world leader of the 90s, dragging European leftists along with, or the like. However I´m not speaking about real life politics or ethics. I´m speaking about a boardgame which relies on an influence system which doesn’t care about good or evil. Socialist governments in western europe or military juntas in South America are pretty different ways of doing politics but they appear in the game just as a mean to put or remove influence. That´s my point. Was Gorbachev a leader who increased the influence of USSR power in the world or did he indirectly accelerate it´s downfall? That *was* what I was talking about, except for my first paragraph – the “okay you mean sheer power & conquering crap” interp. Being the good guy IS stronger, even from a strict cynical power politics view.